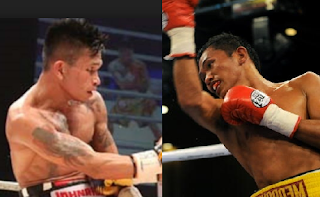 Former IBF World flyweight champion Johnriel Casimero is now moved up in the Super Flyweight division where he will face the former world title contender Richie Mepranum. Casimero who is coming off a TKO wins over Charlie Edwards last year of September is a 2 divisions world champion and now gunning for his 3rd. Johnriel has a record consisting of 23 wins including 15 big victories by way of KO and has only 3 defeats. Casimero won his first world title against Moruti Mthalane in 2011 and won big fights outside the Philippines. The 27 years old boxer from Ormoc City, Leyte, Philippines defeated highly rated boxers including Pedro Guevarra, Luis Alberto Rios, Amnat Ruenroeng and Luis Alberto Lazarte. Casimero is consistently a world title contender since 2009. On the other hand, Richie Mepranum is a 30 years old boxer with a record of 31W(8KO)-6L-1D. Based on his record he is not a hard hitting boxer but a very smart boxer. Mepranum fought two times for a world title but beaten by Julio Cesar Miranda in 2010 for the vacant WBO World Flyweight title, Juan Francisco Estrada in 2014 and Carlos Cuadras in 2016. Mepranum also lost to Luis Nery in his last fight via 2nd round TKO. Casimero vs Mepranum will be held at Iligan City public plaza, Iligan City, Lanao del Norte on June 25, 2017.